Soshana, born Susanne Schüller in 1927 in Vienna, was forced to flee in 1938, first to Switzerland, France, England, and finally New York. She had her first major exhibition in Havana in 1948, using the name Soshana as a pseudonym. Her early works are portraits and still lifes painted in a realistic naïve style. Her style changed to abstract reflecting the political circumstances of the post WWII era and her reaction to world events. Soshana created her own visual language using strong expressionist strokes bringing to the surface her subconscious fears and hopes. Her work contains an underlying insecurity and existential yearning for a better time with moments of vivid clarity and hope. This exhibition is sponsored by the Federal Ministry for European and International Affaires of the Republic of Austria and the Austrian Cultural Forum, New York. Alberto Giacometti sketched her with her hands either clasped in a saintly pose, or clenched out of neurosis. In one drawing, her shoulders are hunched, her neck inquisitively thrust forward, and her face open, as if nervously searching out viewers for their thoughts. The setting is a Paris atelier, 1958. In Vallauris in 1954, Pablo Picasso rendered the same woman, a painter known as Soshana, in darker strokes, with her hair exotically styled, and wearing a jacket deliriously striped. Here, her pose is reminiscent of Picasso’s famous portrayal of another tough female artist—Gertrude Stein. The gazes in both Picasso portraits are oblique, off to the side, as if women as strong as Stein and Soshana were not comfortable being made the objects of another’s appreciation. No mistress and no muse, Soshana never hoped to be known as a subject, but as a master in her own right. One of the most diffuse, enthusiastic artists of the twentieth century, Soshana was born Susanne Schüller in Vienna in 1927, a daughter of the Jewish bourgeoisie. She received her earliest formal education amid the most rarefied of that milieu, attending Vienna’s Schwarzwaldschule, the first of the progressive girls’ schools founded by philanthropist Eugenie Schwarzwald (who was the inspiration for Ermelinda Tuzzi, heroine of Robert Musil’s epic novel of the period, The Man Without Qualities). Such a nontraditional institution needed to staff itself with nontraditional faculty, and its roster reads like a roll call of the Austro-Hungarian avant-garde: Schoenberg taught music, Adolf Loos taught architecture, and Oskar Kokoschka led a class in drawing. This school was where Schüller learned that being a woman didn’t preclude a painting career launched with the most liberal of ideals. No idealism could curb the Anschluss, however, and the Schüller family escaped Austria for Switzerland, arriving in London just in time to witness the destruction of the Blitz. 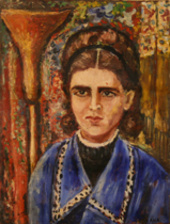 Finally, in 1941 the Schüllers arrived in the United States, where their only daughter met her husband, the painter Beys Afroyim (the Zionist cognomen of the Polish-born Ephraim Bernstein). Together with their son Amos, born in 1946, the Afroyims spent the latter 1940s traveling the country, sustaining a poor, boardinghouse existence by selling Schüller’s portraits of America’s Mitteleuropean refugees: Portraits by “Soshana” exist of composers Schoenberg and Hans Eisler, conductors Bruno Walter and Otto Klemperer, authors Thomas Mann and Lion Feuchtwanger, and Franz Werfel on his Los Angeles deathbed. In America, Schüller’s identity was split. She became a dutiful wife and mother, even while experimenting with the persona of “Soshana,” the moniker she first used, on her husband’s recommendation, in conjunction with her first solo show in Havana in 1948 (that name, the Yiddish for Hebrew’s Shoshana, means “lily-of-the-valley”). Her self-portraits reify this divergence. Soshana painted herself in the manner in which all Modernist men painted themselves—flattering their vanity with unflattering strokes, heroic in their ordinariness and exhaustion. In 1945, she stares seriously, her eyes intense, exophthalmic, while her mouth makes a petulant, desexualized mockery out of Modigliani’s sensuous Jewish puckers. Her brows, which even in photographs are her most memorable feature, are ostentatious, firm and furry, reflecting the severe central part of her hair. In a 1951 portrayal, her eyes are even more swollen than before, angrier, and she is holding flowers as if they were soured, disgusting objects, the decorations of a domesticity she was about to cast off. In Paris in 1955—having abandoned her husband and son in the United States in order to pursue her independence as an artist—Soshana paints herself again, now a liberated, and libertine, member of a creative community: In Artists in Paris she stands off to the side—a peer of the surrounding characters, struggling unknowns including the Indian painter Krishna Reddi, and the Japanese Tomoko Nakano (asked to label the painting’s other subjects later in life, Soshana had forgotten their names). Though superficially something of a bonne vivante, Soshana suffered in her studio. There her life became a sort of feeling, functioning canvas for the sufferings of others. Unlike many of her contemporaries, who also made the mid-century journey from figurative art to abstraction, Soshana was guided not by any painterly hand or eye but by ideas, by politics, and by moral conscience. This condition gives her art a disembodied quality; making her portraits—even her self-portraits— seem somehow incorporeal. Soshana’s best paintings, then, are of decimated, depopulated landscapes, and their literary or programmatic moods can be inferred from a recounting of her titles: Fury of the Marshes, Chrysanthemum and the Spider, Dead City, Sad Flowers, Pain, Solitude, Disintegration, Bombed-Out Church, and The Wandering Jew. This “Cassandra of the canvas,” as the Parisian press called her, soon tired of the French capital’s competitiveness, and, turning tourist, took her horrors on the road. Traveling Asia and Africa, Soshana exhibited her artwork—which decried poverty and war amid landscapes more poor and war-torn than any she had previously seen—to the terror and delight of Anglo-American and French expatriate communities. India’s Statesman called her “a prophet of doom—atomic warfare, loneliness and unemployment are her themes.” The Ethiopian Herald noted her “scenes from death, pain, doom, destruction, anxiety and loneliness.” In 1957 Soshana was invited by the Chinese Cultural Ministry for an unprecedented show at the Imperial Palace in Peking. In 1959 she visited with and painted Albert Schweitzer in a leprosy lazarette in Lambaréné, Gabon. Strange attractors, Surrealist connections, abound: Soshana once met the painter Francesco Clemente at a school for yogis in Madras, and chatted up the writer Graham Greene on a flight to Soviet Russia. In 1959 Soshana resettled in Paris, where she collaborated on mock cave paintings with Giuseppe Pinot-Gallizio, while involving herself with the Danish-Belgian-Dutch art collective CoBrA. That movement’s neo-Lascaux motifs and hermetically significant glyphs would be integrated with Soshana’s emerging interest in Japanese and Chinese calligraphy, resulting in an art of grids and mildewed textures, overlaid with an alphabet indecipherable in its violence: jagged scribbles signified as wounds, ripped by clusterbombs of color, symbolic of primal pain as well as of the revolutionary struggles of the mid-1960s. After time spent in Cuernavaca, Mexico, Soshana embarked on a third world tour, visiting the South Seas, the Caribbean, Thailand, Bali, Australia, India, Nepal, Afghanistan, and Iraq, partially paying her way by painting portraits, including a rendering of the king and queen of Sikkim. In 1972, slowing down, Soshana moved to Israel, and the following year her Israeli debut exhibition was scheduled to open on the day of the beginning of the Yom Kippur War. In 1974, Soshana returned to New York, where her style, or styles, changed yet again, accommodating both Pop cartooning and a renewed darkness, this time representing urban grit, specifically the neglect of downtown New York. Soshana’s art and life were so varied not out of any appetite for change or intellectual restlessness, but out of a profound dislocation and social anxiety. She did not know whether she was a weakened victim of Nazism, or an iron survivor set out to master the masculine world. In Paris she painted like a Parisian, and in New York she painted like her favorite New Yorkers—first generation Abstract Expressionists such as old friends Mark Rothko and Adolph Gottlieb, both of whom had died by the time of her Manhattan arrival. In her very itinerancy Soshana became the prototypical Jewish painter, a painter who—more than Chagall and Chaim Soutine, more than Rothko and, later, even more than Philip Guston and R.B. Kitaj—adapts her mind and styles to those of the cultures that host her wandering. In the 1980s, Soshana returned to Vienna, where she still lives and paints, her career promoted by her son Amos, with whom she was reconciled after the death of his father in 1984. In March 2008 Austria released the 55-cent Soshana stamp, featuring her 1981 New York painting Rainbow. Her best recent paintings have been political, in series entitled Kosovo, and Middle East. Two newer canvases, currently on view in a Soshana retrospective at the Yeshiva University Museum in New York through February 2009, are called N.Y.C. I 2001, WTC and Chorramshar—Irak 1992; both paintings are bold and confrontational, tempting iconoclasm by directly representing the tragedies of their titles. A 1991 self-portrait is called The Way I See Myself, and while it’s not yet an epitaph, the stark presence of death overwhelms. Here she presents herself as a hysterical skeleton, a ravaged black figure boxed in by bars of black paint shot through with red and blue bristles. The canvas is entirely naked beneath, as if imprisoned by these lines, by Soshana’s figure. One of Soshana’s eyes is left open to this surface—the outline of a hole giving way to bare canvas, a grainy, pixilated ground like the Polish snow that would have been her fate. Soshana’s career can be seen as a model for the last aesthetic that might still be called Jewish: empathy, or compassion. She absorbed, and as an octogenarian continues to absorb, the sorrows of others and, by way of interpretation, offers them out again as uniquely, biographically, hers. Soshana’s highest desire is to be modern, or new, which is to say, to be fashionable, and necessary. She wants, like many people want, to always be young. This makes for an art of insecurity—an art that is occasionally, if glimpsed between poses, beautiful in its desperation for the beauty it lacks. Joshua Cohen is the author of four books, including the novels Cadenza for the Schneidermann Violin Concerto and A Heaven of Others. Graven Imaginings, a novel about the last Jew, is forthcoming from Dalkey Archive Press.